Since many yards don't have the advantage of receiving sunshine during the day, many gardeners ponder what kinds of plants can grow in the shade. There are plenty of choices for shade loving plants that thrive in low light, from flowers and vegetables through trees and shrubs. Although many people think only ivy and low-lying shrubs thrive in dark or shady areas, largely based on pictures of old stone structures covered with or surrounded by such foliage, many varieties of plants actually prefer the cooler climates of shade. Perennials: These varieties thrive on shade and stand up well to cold weather. Hostas are one of the most popular perennials and come in over 2,500 varieties with blooms in hues of pink, gold, white, light purple and pink and large, multi-shaped leaves. Other favored shade loving perennials include Virginia bluebells, primrose, bleeding hearts, columbine, Jacob's ladder and ground orchids. Annuals: Your garden can be full of vibrant colors year round with a wide range of flowering annuals. Forget-me-nots, pansies, impatiens, begonias, coleus, violas, cyclamen, wishbone flowers and caladiums all bloom brightly in a shady garden. Bulbs: Flowers that grow from bulbs are amenable to many different environments, including cool, shady ones. Crocus, daffodils and snowdrops are good flowering bulb plants for darker garden plots. 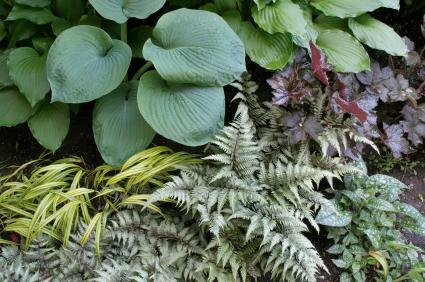 Ferns: Ferns are a great choice because they come in so many varieties and colors. Although the bulk of fern types are green, variegated strains like Pictum or Lady in Red include fronds streaked with burgundy, purple and silver, which add a dramatic touch to a garden. Ivy: Nothing beats the versatility and hardiness of ivy. It has leaves of varying sizes in a wide range of colors from green to white and can be trained to cover the ground, climb walls or trees or grow up a trellis in large containers. Ivy grows equally well in shade or bright sunshine. If you are looking for shade-friendly foliage that is extremely low maintenance, you'll find many options. Trees: Dogwood trees are the most popular tree to plant in sun-deprived gardens and yards. Other varieties that don't require a lot of light include Japanese maples, paw paws and red buckeyes. Shrubs: Both evergreen and deciduous shrubs prosper in shady areas. Popular choices include yews, azaleas, sweet bay, boxwood, cherry laurel and holly. Groundcovers: This type of foliage requires the least amount of care. Japanese pachysandra and English ivy are readily available throughout the country and grow in almost any type of soil. Beware of the proliferation of English ivy, as it is highly invasive and will take over other plants if not regularly cut back and pruned. The best way to determine if a vegetable is shade tolerant is if it is grown for its leaves rather than its roots or fruit. Chard, mustard greens, collard greens, spinach and some types of leafy lettuce easily withstand shade and will thrive if the surrounding soil is regularly watered. Many herbs can withstand shade if they get a minimum of light, even filtered sunlight, for two to three hours a day. Shade-tolerant herbs include parsley, cilantro, chives, basil, rosemary and thyme. Before choosing any plants or flowers for a shady garden, closely monitor the amount of sunlight the area gets each day and if it is direct, indirect or affected by the shade of large trees. If the trees are deciduous, take into account how many months a year they will fail to shade the area. Armed with this information, visit a reputable nursery, present the data to a professional and get recommendations on what kinds of plants can grow in the shade of your particular garden.